We recently checked out Wild bakery in Fremantle, a cozy little bakery off South Terrace on Commercial St. The bakery has evolved from weekend farmers markets to their first actual store. They specialize in fermented sourdoughs but we weren’t there for that this time at least. We wanted to get our hands on the fabled ‘bronut’ a bit of a Perth urban legend of late as they seem to sell out so fast. 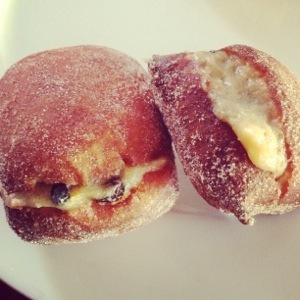 It’s essentially a buttery brioche donut with a yummy filling. Why call it the bronut? I’m not sure, but damn it was delicious. The filling changes each week, when we came in it was a very Christmassy fruit mince pie inspired custard, spiced and with raisins. I’m not really a fruit minced pie fan and even I would go for another. The donut itself had a crisp outside coated in cinnamon sugar. The inside was soft and delicious, they’ve really got the bronut down to a fine art. I’ve heard tell of salted caramel or lemon cream filings other weeks so I’ll have to try my luck again next time. 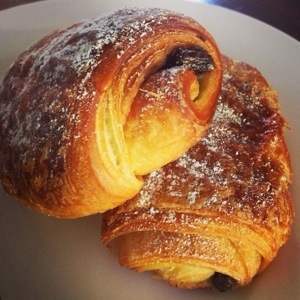 We had to try the chocolate croissants while we were there, after all a good French pastry is the true test of a bakery is it not? The chocolate may not have been necessary for this exercise but who can resist chocolate? Of the two croissants we bought one was a touch under done and a little doughy in the middle. The other was pretty close to perfect (the line between under, over and just right is a pretty fine one) flaky and buttery pastry, chocolate and crispy outside. To die for good. They weren’t the largest croissants around but they were done well enough that we didn’t mind. If you’re at the South Freo end of town wild bakery is definitely worth a look in! Have you tried a bronut? What did you think?